This is my sister’s super special secret recipe for chicken shish kabobs. She finally shared this with me for a garden party for the opening of the Doctor Yum Project Teaching Garden and they were a hit! Kids love the juiciness of the chicken and the colorful arrangement of veggies. If you have any kid helpers let them smell and sample the different herbs. 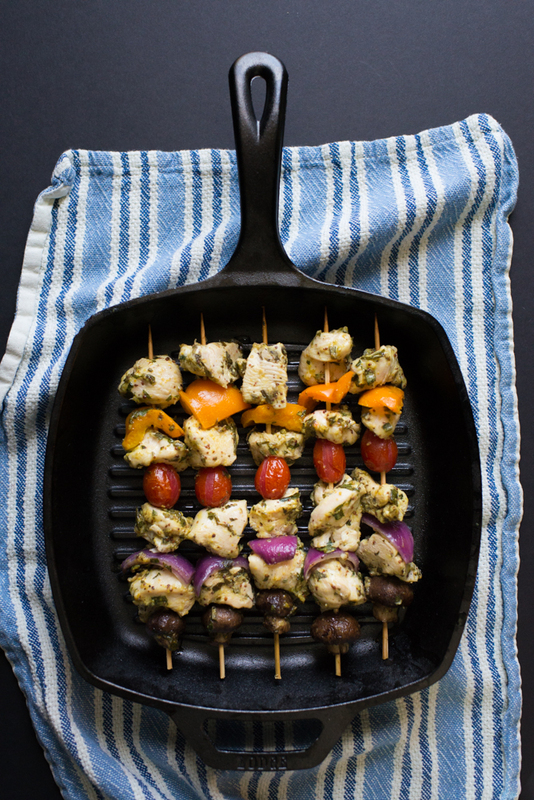 Kids can chop or tear herbs for the marinade and help arrange the veggies on the kabobs. Combine the first 7 ingredients to make the marinade. Marinate chicken the night before. The next day, assemble kabobs and vegetables onto skewers and pour excess marinade on to assembled kabobs to season the veggies. Cook the kabobs on a hot grill until the chicken is no longer pink inside and veggies are softened slightly (about 3-5 minutes on each side).